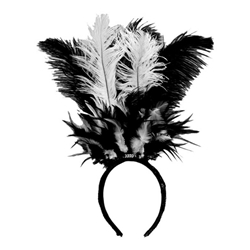 The black and white feather head band can add the finishing touch a number of different costumes including flappers and show girls. They can also be used by directors in shows including "Guys & Dolls," "Seussical," and "Hello Dolly." The black and white feather head features multiple black and white feathers attached to a flexible sequin head band for a secure fit to almost any head size.